Germany’s Federal Office of Criminal Investigation (BKA) announced on April 3 that “potentially threatened institutions in Afghanistan,” including bases of the German Bundeswehr, had been warned of possible terrorist attacks from two German citizens (DDP, April 4). The Germans are believed to have passed through Egypt, Dubai, Iran and Pakistan on their way to Afghanistan, making it difficult to monitor their progress. Pictures of the two men, 20-year-old Nuenkirchen native and convert to Islam Eric B. (alias Abdul Rafar) and a native of Lebanon with German citizenship identified as Houssain al-M., were sent to Afghanistan, where they were circulated amongst German personnel and placed on public wanted posters. According to German security officials, the two are operating under direct orders from al-Qaeda and the Taliban (Der Spiegel, April 7). The suspects are believed to belong to the Islamist Jihad Union (IJU), a radical Uzbek organization that has taken roots in Germany. The two are also believed to be associates of the so-called Sauerland cell, which was broken up by German authorities while planning a major attack on a U.S. military base in Germany. The Sauerland cell included two native German converts to Islam, Daniel Schneider and Fritz Gelowicz, as well as an ethnic-Turkish German citizen, Adem Yilmaz. Another ethnic-Turkish German, Cuneyt Ciftci, a.k.a. Saad Ebu Furkan, died in a March 3 suicide bombing on a U.S. military post in Afghanistan’s Khost province that killed two U.S. soldiers and two civilians. Responsibility for the attack was claimed in a video by Jaluluddin Haqqani, the veteran jihadi and leader of the Taliban-allied Haqqani network. Like the members of the Sauerland cell, the latest suspects are believed to have received training from Taliban elements in the Waziristan region of Pakistan. Houssain al-M. was arrested in Waziristan by Pakistan’s Inter-Services Intelligence (ISI) last year and deported to Germany (Der Spiegel, April 4). Another German from the state of Hesse, identified as Sadullah K., was killed in a U.S. airstrike on a training camp along the Afghanistan/Pakistan border last October (Spiegel Online, March 15). 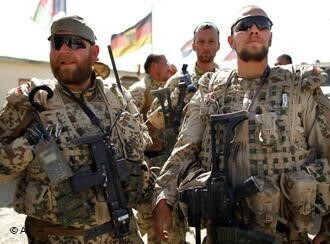 The warnings come as Germany’s parliament is considering the future of Germany’s mission in Afghanistan. Germany’s ISAF contingent of 3,500 troops operates in the relatively quiet northern provinces of Afghanistan—Regional Command North, based in Mazar-i-Sharif—under a caveat that prevents them from participating in combat operations. The Taliban has promised to open a new front to engage these troops as part of its spring offensive; three German soldiers were injured in an attack on their tank on March 27 (Deutsche Welle, March 27). There are also plans to add 500 new counter-terrorism agents to the BKA, including doubling the size of the Mobile Task Force (Der Spiegel, April 7).